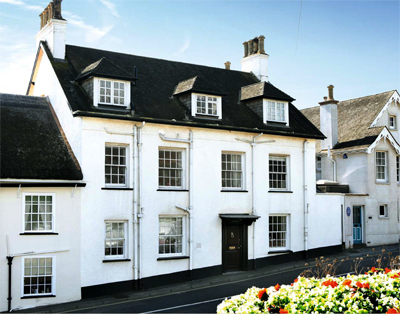 Clifton House is understood to have been built in 1808 as part of Heffers Row, a collection of fishermen’s cottages and lodging houses in Sidmouth in Devon. It is now one of the listed buildings with direct frontage to Clifton Beach. 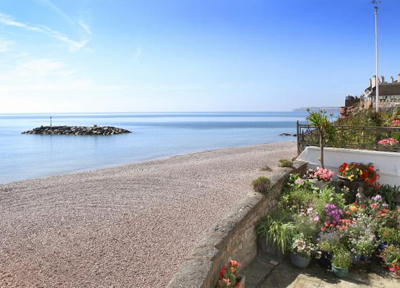 The accommodation is laid out over three floors and includes a number of elegant, well-proportioned reception rooms with views over Lyme Bay, and four double bedrooms, one of which is on the ground floor. The reception hall leads to the dining room, which has a fireplace and a door opening onto the terrace. From there a door opens into a beautifully presented morning room with a fireplace and bay window overlooking the sea. The kitchen has an extensive range of units under granite work surfaces and a Sheffield range-style cooker. Steps lead up to the utility room. Also accessed from the hall is the double bedroom on the ground floor. Stairs from the hall lead to the first floor, where double doors open into a large drawing room with uninterrupted sea views from three windows. Also on this floor is the study, which could be easily converted into another bedroom, as well as a double bedroom and a recently fitted bathroom. On the second floor are the dual aspect master bedroom suite and a further en-suite double bedroom overlooking the sea. The landing gives access to a boarded 30 foot loft. master bedroom and the family bathroom. Outside, the property has a large paved terrace with direct frontage to Clifton Beach and a nearby double garage with workshop space with hobby room/art studio over. Sidmouth is a popular seaside town which was developed by the Georgians and the Victorians. Honiton is around nine miles and offers a wide range of facilities and a railway connection to London (Waterloo). Exeter is 16 miles to the west. The guide price is £1.1m. For further information please contact Strutt & Parker on 01392 215 631 or visit www.struttandparker.com.